With virtually no expiration date and providing natural sweetness without the chemicals, it’s no wonder why raw honey has taken on a real life of its own in recent years. The National Institutes of Health (NIH) reports that honey has been traditionally used to treat a variety of infectious diseases or viral infections. Aside from this, the dietary value and natural sweet qualities of the substance makes it highly popular with nutritionists, dietitians, and anyone hoping to cure their sweet tooth without resulting to using added sugars. There’s so much more to honey—which is why we’ll be breaking down exactly why we think raw honey needs to be a part of your next meal. Afterward, we’ll also be choosing our top six kinds of honey that you need to try out, as well as explaining everything you need to know about honey before making a purchase. Raw honey is certainly the best honey for most situations—but going through the differences between raw honey and it’s processed counterpart is going to involve a bit of an explanation. As most are aware, honey is a food product produced by bees. It occurs from regurgitated flower nectar and constant fanning from the bees in the hive, resulting in a liquid filled with nutrients and simple sugars. Raw honey can be defined as this base form of honey, either eaten right from the beehive or jarred without heating or filtering. Raw honey also contains pollen, which can make or break the FDA mandated definition of honey. Honey, in its purest form, comes with some healing and curative properties which has made it a prime food item for nutritionists. Specifically, raw honey is hailed for its antibacterial properties, which have been widely studied. Due to its chemical makeup and acidic quality, the NIH has reported that honey characteristically inhibits bacterial pathogens. This property is why scientists and botanists throughout the centuries have turned to honey to stop infections and prevent diseases from spreading. On a nutritional level, raw honey comes with several nutrients needed in the human body. Since honey is a regurgitated substance, dormant enzymes coming from bees means that raw honey is filled with antioxidants. Naturally occurring antioxidants have been shown to be more effective than other supplemented antioxidants. Antioxidants also help to lower the risk of chronic diseases, heart attacks, cataracts, and other such issues. The difference between raw honey and processed honey is a contentious debate. As we’ve mentioned, the complete filtering of pollen content in honey means that it cannot simply be sold as raw honey. Likewise, clinical trials determining the amount of pollen and antioxidants removed by common filtering methods fail to determine whether the curative properties are lost. In short—it isn’t completely clear whether or not processed honey contains the same amount of nutrients and antioxidants of raw honey. Which is why it’s important to seek out raw honey whenever possible if gaining these benefits are important to you. It’s also important to note that honey sold in the United States is not required to state which flower or flowers from which it was created from. Raw honey varies in quality and purity from the source, so finding the specific type of honey you desire from processed brands is going to be next to impossible. The best honey for nutritional value is always going to be raw honey. Depending upon your location, it may be wise to seek out local beekeepers or a local farmers market first, before turning to the stores for your raw honey needs. However, if this isn’t an option, don’t fear. Due to the long-lasting properties of raw honey, your preferred honey type and brand can often be picked up online through digital marketplaces. No matter where you live, the best honey for you could be just a click away. Before we break down our top six kinds of honey for taste and nutritional value, it’s important for us first to explain how and why we choose our honey. Although the FDA doesn’t always require it, we value transparency and honesty when it comes to explaining how honey is made by a certain brand. Likewise, while all of our below picks qualify as raw honey, companies will sometimes infuse their yield with herbs and other naturally occurring substances to increase overall quality and nutritional value. Both aspects have been taken into account, as well as the public’s perception of the taste and quality of the honey. It’s important to use that all of our picks could be the best honey for a certain type of person. If you’re unsure of which honey to get, stick around for our Buyer’s Guide to read up on what you need to know before purchasing one of our below picks. Want the to try some of the best types of honey? Check out our top picks. As an Amazon Bestseller, Nature Nate’s raw honey production remains popular for its low price and no-nonsense labeling. Nature Nate’s 100% Pure raw honey is stated to have been made in North America and has been heated and strained to help create a more balanced mixture. There are no added ingredients or materials, but some purists may not be a big fan of the filtration process, which has left this particular brand of honey more transparent in color than most. Still, public perception is high, and the taste of Nature Nate’s is reported to be excellent for eating alone as well as using to sweeten a variety of meals and treats. For the traditionalists out there, this raw honey probably couldn’t be any more simplistic or straightforward. Whereas Nature Nate’s honey was strained somewhat to increase spreadability, the Y.S. Organic Bee Farms raw honey is packaged as-is. No straining, no filtering, no heating of any kind of proudly displayed on the labeling, which can make this perhaps your best bet for an authentic raw honey taste. However, raw honey in this form, especially without any straining or heating, is going to taste somewhat different than strained raw honey. The texture and flavor will not be as consistent with what you may feel honey should taste like, so if that’s a problem, perhaps another option would be right for you. Otherwise? Y.S. Organic Bee Farms have made perhaps the most no-nonsense honey on our list. If knowing exactly where your honey comes from is important to you, then Crockett’s raw honey might be your best bet to get raw honey in bulk. 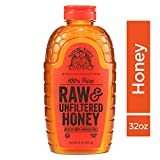 Coming in a large, 3 lb bottle, Crockett’s Unfiltered Arizona Desert Wildflower honey is popular and delicious honey that’s clear about its heritage. For over 60 years, the Crockett company has been producing this raw honey, strained and somewhat heated, for all health enthusiast to enjoy. There have been some reported issues with shipping, however, which keeps us from being completely enamored with this product. However, having specific information about the location helps everyone when trying to figure out which flavor and brand of honey are right for them. Much like Crockett’s Arizona Desert Wildflower honey, Desert Creek’s decision to list the location of the honey’s production in the name helps those more concerned about the sourcing of their meals. Otherwise, like Y.S. Eco Bee Farms, Desert Creek’s honey isn’t heated or strained in any capacity. This can result in some confusing flavors for those unused to the taste, but for everyone else, this is some solid Texas honey. While a little on the pricier side, this flavorful, warm honey is one of the most popular online for slick packaging and a variety of flavors. Bee Harmony’s honey certainly catches attention with its minimalistic packaging and slick flavors. While they offer many different variants, nothing has been added to their raw honey. The only processing done is in warming the honey to make it spread better. While other flavors are available, this orange blossom variant seems to be the most popular and most loved. Unlike the other honey on our list, Wedderspoon’s offering here requires some explanation. 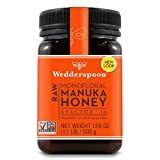 More often than not, Manuka honey—that is, honey sourced from the New Zealand Manuka tree, is especially sought after for nutritional and healing qualities. The scientific evidence behind the benefits of raw manuka honey versus raw honey is a little scarce, but the specific taste and texture of Manuka honey, especially to those well-versed in honey, can make all the difference. That’s why Wedderspoon promises at least 75% purity when it comes to their honey. Because of the imported nature of the product, you can expect the price to be significantly higher than domestic counterparts. Still, if you’re hoping for the maximum possible purity and quality from your honey, this might be a great place to start. As you could probably tell by some of our notes above, not all raw honey is made or sourced equally. Being particular about the heating and straining process, as well as about where and how the honey is sourced, can be huge to certain nutritionists and contentious buyers. Keeping in mind precisely what each term means as well as whether or not you’re comfortable with each process is important for picking up raw honey. It can be difficult to attest to the nutritional value of honey after each of these processes took place—but not beforehand. If you’re adamant about having honey that’s as raw as possible, either seek out a local beekeeper or be sure that none of the four above processes have taken place on your honey before consumption. There’s much more to honey than bees and beekeepers. There’s never been a more popular time to try to eat right and be more conscious of where and how our food is sourced. Because of this, researching a product like raw honey can be initially difficult to navigate through. We highly recommend each of our top six kinds of honey and know that there’s a person out there for which each is the best honey on the market today. Some will enjoy the taste and texture of strained and heated honey, while others might like the thick, viscous texture of true unprocessed honey. Always be vigilant, and do your research on the sourcing of your honey before making a purchase. Taking a short amount of time to ensure what you’re buying is pure could prove to be massively beneficial in the long run. We hope that we’ve given you good reason both to consider incorporating raw honey into your life, as well as shown which products are great places to start. Whether you need honey to lower risk of chronic diseases or simply sweeten drinks, there’s always a good reason to go unprocessed.